My Thanksgiving was incredibly different this year. In the past, my Aunt and or my Mamaw would host Thanksgiving at one of their houses, but some years are crazier than others, and some years my family is tired so we end up taking the easy route and road trip it over to the next city and eat at a buffet. Andrew and I arrived at my Mom's thinking that we would have a whole slew of family members (all my Aunts, Uncles, and Cousins) waiting to load up and head to a nearby restaurant that we sometimes go to on Thanksgiving Day. This was a buffet year, however, and as we headed over to my Mamaw and Papaw's house...my Mom informed me that it was just us. Just me, her, Drew, my Mamaw and my Papaw. I was shocked, and a little sad that everyone had their own thing going on this year. My grandparents are 82 and 80 years old. I'm very close to them, and I adore them more than I can even put into words. AND even though I was super sad the whole family didn't spend Thanksgiving together this year...it turned out being one of my most favorite Thanksgivings in the entire world. I got more one on one time with my Mamaw and Papaw and my Papaw and I took a lot of iPhone photos (he's such a hoot) and all in all, it was just a lot of fun! When we got back to the house, we had no clean up so what was there to do? Well, a photo shoot of course! These pictures make my heart warm and so incredibly happy. I will share those really soon...because I have something else I want to share with you today. This video means more to me than anything I've ever owned. I will cherish this forever, as I know my family will too. Mamaw and Papaw from Shalyn Nelson on Vimeo. I hope and pray Drew and I will be just like my grandparents one day. Old, in love, and laughing. My life would be complete. Oh gosh. That video. I don't even know them and I'm tearing up. What a SPECIAL special video!! Beautiful. I just started the video (at work!) and started to tear up. Looks like I'll have to revisit this tonight! ;-) What a beautiful, beautiful relationship!! Oh my. That was an amazing video! I don't think I have cried like that in a VERY long time! I lost my grandad last year and my grandpa this month. They were both VERY much like your Papaw.... witty and never serious! I am not sure there is anything in life that you can do to surpass this video. Great work! Oh... what I would give to have this of all of my grandparents. You have the sweetest heart ever! Shay! I have always been a lurker, never a commenter, but this did the trick! So, so adorable and you can feel the love they have through the computer, I swear! Awesome job and what a great memory to have! beautiful video. I couldn't stop crying. Amazing! Such a sweet couple! "Not much of anything that night!" I died. Your papaw is hysterical & your mamaw is so smiley! BIG OLE TEARS OVER HERE. This is amazing. This is the most perfect video ever. I'm crying. I'm laughing. What a special, special memory. O my goodness. Oh Shay! This video is priceless! So sweet and so much love. oh my goodness. i die. that is the best. my grandparents have been married 52 years and it's awesome. BIG CROCODILE TEARS. Omg. You are so lucky to have both Grandparents in your life. I can't stop crying. Not cool to make me cry at work. Definitely tears and laughter. This is wonderful, you did a great job! You are so lucky to have them in your life and to have this to keep forever. This was the sweetest thing I've ever seen. My grandparents have all passed, so you've got me really reflecting right now. This brought tears to my eyes and a smile on my face. Thank you so much for sharing! Oh my gosh, Shay. This made me laugh and tear up. So sweet. Absolutely beautiful!! The tears are flowing. SHAY!!!!!!!!!!!! This made me giggle and tear up and get goosebumps. Your grandmother is a doll and your grandfather is the sweetest, funniest man! Thank you for sharing this with us!! That is the sweetest video ever!!!! I teared up and bawled like a baby when he said walking in life and the path is getting short!!! They are the sweetest couple ever!!! That was beyond adorable! How sweet and in LOVE they are! and what a blessing that you did that - so so so wonderful. What a fabulous testament to marriage. 61 years!!! They are just too cute!!! I teared up. What a precious, precious memory to have on tape for your family. Shay, this is the most precious thing I've seen. Grandparents are such a blessing. I wish my family would have done something like this. This is the sweetest thing I have ever watched. They are so sweet. I cried when he said walking thru life together and the trail is getting short. Such a blessing to have them. Wow are they ever adorable!!! Your Papaw and Mamaw are flippin' hilarious! This will be a wonderful video to look back on in the future :) Love it! I think your grandpa is the cutest man on earth!!! Reminds me so much of my Grandpa, I miss him every day! You are so lucky to have him in you life!!!! This video definitely got the tears rolling. What I would give to have my grandparents around for just a few more hours. You are very lucky to have such a sweet video to look back on and share with everyone. and the comment about not wearing many clothes LOL!! this is so amazing adn such a great memory to have forever and ever! i love mamaw and papaw! Huge, massive, ridiculous tears through this entire video!!! Sooo glad I'm leaving work or I'd have a lot of crazy looks the rest of the day with messed up mascara ;) You and DDHP are well on your way to this happiness and will have such an incredible journey of your own to share!! This is so special, Shay! LOVEDDDD that video!! So cute! They are so in love and it shows in your video! I hope your grandparents know that they brought laughter and tears to so many bloggers today! Thank you so much for sharing this with all of us Shay! Very beautiful and special!! This is so sweet! I love seeing true and lasting love! Your grandparents are adorable Shay! oh my heavens. How precious and how sweet. Such a great treasure shay. :) love you! Oh my goodness! This video made me tear up at work. Thank you so much for sharing!! Awwwww so sweet! I cried and laughed! What a treasure to have. Love it! oh my goodness Shay! This made me cry. I love that your mamaw said "now you know this is going on the TV" SO stinkin cute! They still seem so in love - this is so gonna be you and drew! "she knows how to wiggle not giggle" - so cute! and your giggle makes me miss you so much! Oh Shay! I wasn't able to watch the video before, so my previous comment was only about the pics ... now that I've watched the video ... OMG I love you grandparents. They are so adorable and in love! I cried and I don't even know them! I want their love story! Thank you for sharing! This is the CUTEST video I have ever seen in my entire life. I hope to find love some day that's as wonderful as the love that your mamaw and papaw have! I love that she kept pinching his knee - it cracked me up. Also, I loved the 'she knows how to wiggle, not giggle' part! ha ha! WOW you are amzing for doing this. I am so inspired. My grandpa just passed in September and the pictures are memories are all we have. 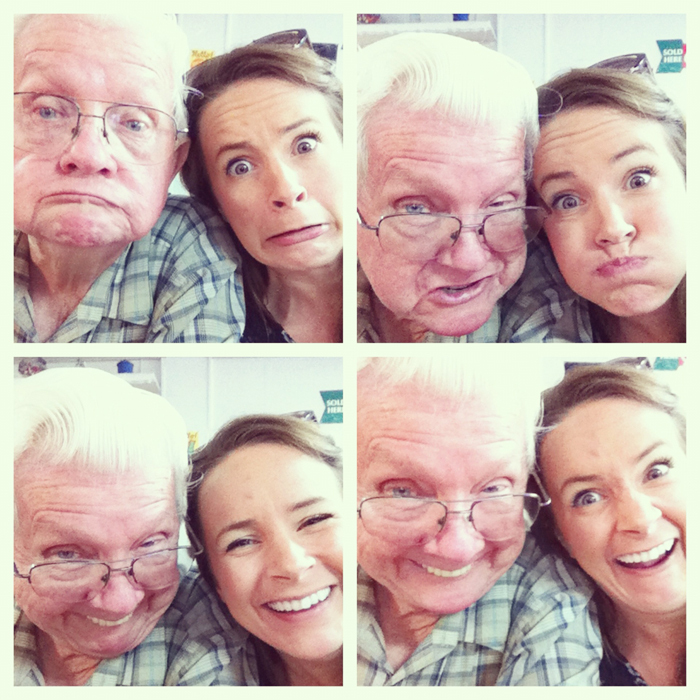 I really should do something like this with my other grandparents. You are so right, this video will mean more than anything, no price tag for something like this. I literally almost teared up. I'm glad your Thanksgiving was time well spent in every aspect. Just lovely. this is absolutely beautiful...i have all 4 of my grandparents still living & it's such an incredibly testament to their love & devotion all these years! absolutely sweetest thing ive ever seen! Beautiful! I would do anything in this world to see my Mamaw and Papaw again... Definitely brought back lots of wonderful memories of my own and plenty of tears! I hope B and I have a love like this. I absolutely loved this video and your Papaw, seriously such a little jokester and charmer. OMG...love this! Found your blog through Carolyn @ Life, Love and Puppy Prints. This was so so so beautiful!!! I LOVE this!! I wish I would have done something like this with my grandparents before they went to heaven! Shay your grandparents are such beautiful people! This makes me sad only because I lost one of my best friends and my grandpa's best friends this year and we have so few videos of them. I know you will cherish this forever and I'm sure you and Drew will have a story like theirs! Right at the end I got all teary-eyed. It seems today that very few people find someone they are happy with for 61 years. Your grandparents are beautiful people and thank you for sharing that wonderful moment of love! Well I cried like a baby. This is so sweet. It does make me sad that we don't have anything like this for my Grandparents, and it does make me want to call my Grandma and do something over Christmas like this. Goodness. What a great little memory to keep forever. That is adorable! I love that video. I can't wait to be like that with my husband. They are great role models to have. This made me so hopeful about love. well doesn't this just make you cry! so sweet! I love the pictures of you two. This is such an amazing memory to have! I love your grandparents! I can only hope to be this in love after 61 years. :) This video made me cry! Aww Shay, this just brought tears to my eyes! It was done perfectly - such a beautiful video to keep. What an amazing love they seem to share! oh my goodness i am bawling! I just saw this linked from your other post from today. LOVE. If I'm like them some day my life will be complete. So sweet! I think this is the most PRECIOUS video ever. I. LOVE. This. What a cool family.